Carefully etched walnut wood inlaid with brushed copper. Varnished to ensure the longevity of the surface finish and hung on sterling silver earring hooks. 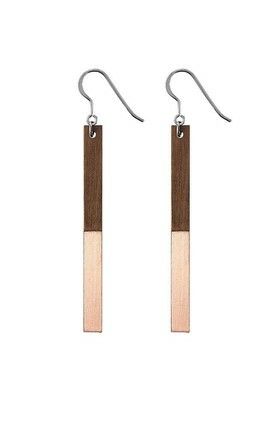 Made from FSC approved 3mm walnut, 0.5mm brushed copper and sterling silver earring hooks. 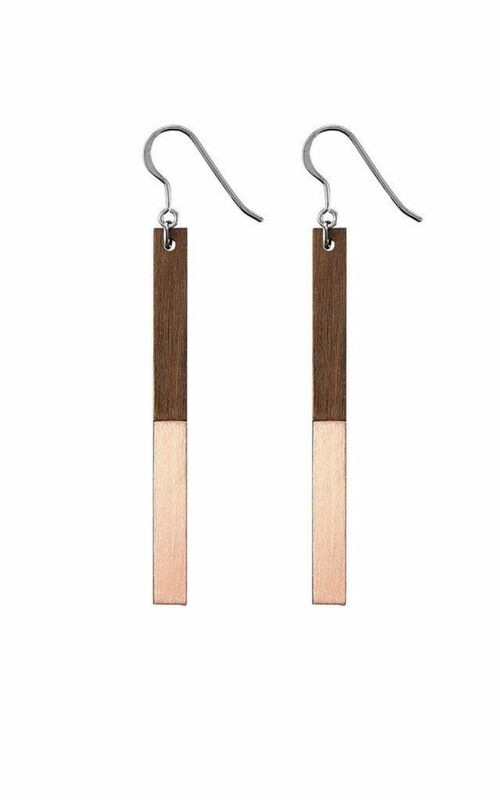 These contemporary drop earrings have been cut from 3mm walnut wood, part of which has been etched away allowing the brushed metal inlay to be insert flush to the wood. Every pair is carefully hand finished and varnished in our London Studio. Due to the handmade nature of these pieces each one will vary in the colour, and natural grain of the wood. Making each truly one of a kind.